To be proactive and leave no stone untunred when it comes to increasing your chances of getting pregnant (whether naturally or with IVF) and setting the stage for a healthy child then there are many natural approaches to help you and the man in your life reach your peak fertility potential. And one of easiest ways is taking on a daily basis, for 3-6 months, the key antioxidants, vitamins and minerals shown to improve sperm count and motility. The Acubalance KISS Male approach is back. We have made it simple for your man to be involved in your fertility journey. We have taken the key nutrients and have them all in one convenient package. This keeps its really simple and also saves you money compared to getting the optimal dosage from 5-10 different bottles. Each day take out one package and all he has to do is take what is in the package. He will notice an increase in energy & mood, less stress, better sleep, mood and improved sperm quality. Pick up your male supplement kit today from Acubalance Vancouver clinic. Video: Poor Embryo Development. Maybe It's Him. Dr Paul Turek, reproductive urologist, shares how poor embryo development can be related to the guy in about 50% of cases. And how diet, lifestyle and a good antioxidasnt supplement can help with sperm DNA fragmentation. Benefits of the antioxidant Male Supplment at Acubalance. 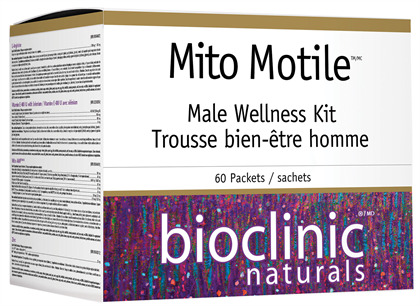 Mito Motile is a comprehensive male reproductive fertility support kit, providing clinically relevant vitamins and minerals, antioxidants and amino acids, essential fatty acids, and critical supportive nutrients for healthy male function. Microcrystalline cellulose, dibasic calcium phosphate dihydrate, hydroxypropylcellulose, coating (carbohydrate gum [cellulose], glycerin), stearic acid, vegetable grade magnesium stearate (lubricant), silica. Dibasic calcium phosphate dihydrate, microcrystalline cellulose, silica, croscarmellose sodium, vegetable grade magnesium stearate (lubricant), coating (carbohydrate gum [cellulose], glycerin). Vegetarian capsule (carbohydrate gum [cellulose], purified water), silica, vegetable grade magnesium stearate (lubricant), microcrystalline cellulose. Softgel (gelatin, glycerin, purified water, carob), flaxseed oil, yellow beeswax, lecithin. Microcrystalline cellulose, dibasic calcium phosphate dihydrate, stearic acid, vegetable grade magnesium stearate (lubricant), coating (carbohydrate gum [cellulose], glycerin) silica, croscarmellose sodium. Contains no artificial colours, preservatives, or sweeteners; no dairy, starch, sugar, wheat, gluten, yeast, soy, corn, egg, fish, shellfish, animal products, salt, tree nuts, or GMOs. Suitable for vegetarians/vegans. Contains no artificial colours, preservatives, or sweeteners; no dairy, sugar, wheat, gluten, yeast, egg, fish, shellfish, animal products, salt, tree nuts, or GMOs. Suitable for vegetarians/vegans. Contains no artificial colours, preservatives, or sweeteners; no dairy, sugar, wheat, gluten, yeast, soy, corn, egg, fish, shellfish, animal products, salt, tree nuts, or GMOs. Suitable for vegetarians/vegans. Contains no artificial colours, preservatives, or sweeteners; no dairy, starch, sugar, wheat, gluten, yeast, soy, corn, egg, fish, shellfish, salt, tree nuts, or GMOs. Contains no artificial colours, preservatives, or sweeteners; no dairy, sugar, wheat, gluten, yeast, egg, shellfish, salt, tree nuts, or GMOs.